On June 1st, Baltimore Mayor Pugh announced that the Potomic street cycletrack would be ripped out, and downgraded to a dysfunctional and unprotected bike lane. This was done to placate residents upset over the loss of a couple parking spaces. The Mayor also wants to “evaluate” other bike projects, which means this could be a precursor to other removals. My endorsement of the United Nations Sustainable Development Goals, including goal thirteen which specifically addresses climate action related to greenhouse gas reduction, recognizes the complexity of these challenges. As a city we cannot ignore the urgency of these issues. It is true we have grown accustomed to politicians who lie and say one thing but do another. But even so, you have to wonder what the Mayor and her staff were thinking when they drafted this statement while working to remove a major bike project. The federal subsidies to fossil fuel producers represent an increase of 35% over levels when President Obama took office in 2009, in spite of calls to remove several major subsidies in every budget that the Obama administration has sent to Congress. This uptick in subsidies reflects the substantial increase in oil and gas producing activities in the US during that time. The vast majority of US national and state subsidies, by both volume and number of subsidies, come in the form of tax breaks and royalty relief, rather than direct spending. Tax and royalty exemptions for oil and gas producers are among the largest federal subsidies for fossil fuel production in the United States. The wealthiest top 10% of the German population is responsible for almost 20% of the total climate impact of travel, finds a new study by researchers from CICERO and IIASA. Yet two-thirds of climate impact comes from the broad middle classes. German travel volume is about five times higher than the global average. “If the global population traveled as Germans for 50 years, the global temperature would increase by roughly 0.8 °C”, says CICERO researcher Glen Peters. The study takes Germany as example, but the researchers say their findings apply more broadly. The relatively few but long trips account for the majority of the impact. The use of aircraft and the fuel efficiency of the car are key determinants. The study notes that two intra-Europe plane trips is equivalent to a year’s worth of driving. Perhaps one more reason for high-speed rail? The recent article “Life-cycle assessment of high-speed rail: the case of California” (Chester, Horvath) analyzes the entire life-cycle GHG emissions of California’s proposed high-speed rail project. The study has gotten a lot of attention in the media lately, because it claims high-speed trains may have negative benefit in reducing GHG emissions compared to automobiles and airplanes. The rather obvious point of the article is that train load-factors determine emission savings. Here the authors show this in graph form for the various occupancy scenarios: 100% load-factor and 10% load-factor (single and double trainsets). Nobody would deny that running nearly empty trains would be wasteful – but is that a plausible scenario? TGV load-factor is 71%. And even the German ICE (which favors clock-face scheduling over load-factors) has around 50%. The energy and GHG performance of CAHSR is dominated by active operation but shows significant contributions from infrastructure construction and fuel (electricity) production. The primary contribution to the infrastructure construction component is from concrete and steel material production. Construction of retaining walls and aerial track segments are the two largest concrete requirements in the inventory (PB 1999). The production of concrete is energy intensive and releases CO2 in cement production from both fossil fuel use for kilns in clinker production and the calcination of limestone. The paper makes a major blunder here because it assumes the infrastructure is only intended to provide the HSR express service. In fact, it will be a shared resource and ideally should generate a huge number of commuter trips (over 15 million annual trips in the case of Caltrain). Yes, let’s count the GHG cost of concrete production, but make sure to divide by the total number of users. 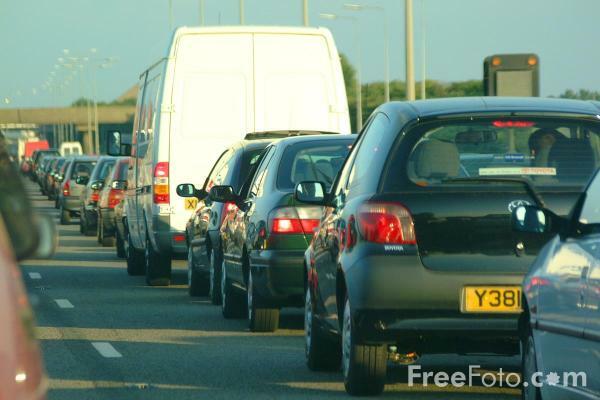 Unfortunately, a study undertaken by the consulting firm Booz Allen Hamilton for the U.K. Department for Transport raises some troublesome questions about whether these conditions can be met in reality. Booz Allen considered two potential U.K. HSR lines (London-Manchester and London-Edinburgh/Glasgow). They found that the CO2 emissions required to move HSR passenger seats were about the same as those required to move automobile seats — hardly a slam dunk for rail. In fact, intercity bus came out considerably cleaner than HSR on a per-seat-mile basis. Of course, this is the same UK Ministry of Transport which for years decades has favored runway and highway expansion over railway investment. So, no surprise they funded a report validating predetermined funding priorities.